Exercise and Breast Cancer - How Important is it for Prevention and Treatment? Home / Blog / Exercise and Breast Cancer – How Important is it for Prevention and Treatment? I once heard an oncology expert say that out of all the adjunctive treatments for breast cancer, exercise is by far the most important. We know that exercise, a healthy whole-foods diet, adequate sleep, and stress management, lay the foundation for improving breast cancer outcomes. There are essential nutrients such as vitamin D, melatonin, and folate that can help prevent breast cancer and its recurrence. There is nothing, however, that compares to the critical role of exercise in breast cancer. We all know exercise is good for us, and research is showing that if there is one strategy for everyone to use, it would be exercise. The value of exercise to your overall health and well-being is so compelling. There is a very clear relationship between physical activity and a reduction in dying from breast cancer. In fact, research has shown that 30 minutes of moderate exercise 5 days a week reduces the risk of dying from breast cancer by a whopping 61%. The exercise must be moderate in order to get the benefit. You can’t just have a leisurely walk; you have to be breathless to receive the benefit. This is a great starting point. We are starting to learn that more is better. Vigorous exercise is even more effective than moderate exercise. Your results are better, and your risk levels improve. It is also true that the more vigorously you exercise the less amount of time you have to do it in order to get the benefits. A great way to improve the intensity of your exercise is to incorporate interval training into a workout. For example, for every 5 minutes of brisk walking you do, add in 1 minute of vigorous walking. If you jog, you can add in the occasional sprint, and if you ride your bike, kick it into high gear every few minutes. This technique not only lowers your risk profile, it is very beneficial for the whole body, particularly the cardiovascular system. One study looked at women who had been walking for 2-3 hours each week prior to being diagnosed with breast cancer. They found that these women were 31% less likely to die from breast cancer than women who were sedentary prior to their diagnosis. The study also found that it is never too late to start exercising if you want to see the benefits. 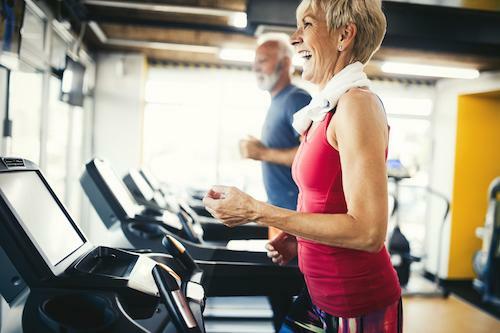 If women increased the amount of exercise they do after they are diagnosed with breast cancer, they were still able to lower their risk of death by 45%. On the other hand, women who exercised and then stopped once they received a breast cancer diagnosis increased their risk of dying by 4 times. The prevalence of inactivity in the general population is much too high. Getting exercise is important. But if we exercise each morning, then sit for the rest of the day, we are still considered sedentary. Many of us might workout daily, then sit at our desks, then on our couch, for the other 15 waking hours we have in the day. Only having 30-60 minutes of movement out of a 24 hour a day is still sedentary. This is a huge wake-up call, even for me! While moderate and vigorous activity is an essential part of maintaining health and improving survival, it is necessary for us to be active all day long. The best strategy is to get up and move every 90 minutes. Walk up and down the stairs, take a walk around the building or the block, or use a walking treadmill under your desk. I am pretty sure there is not another preventive measure that can claim to do all the wonderful things that exercise can do for you. The key is to move all day long and add in moderate and vigorous exercise a minimum of 30 minutes 5 days a week. This will help prevent breast cancer, improve your outcomes if you have breast cancer, and enhance your quality of life. That’s the point, right?